I saw this fab red glitter nail polish in Boots and I had to have it as it is the perfect colour for Christmas. I didn't even notice that the bottle states "High Coverage Glitter Nail Polish" but I certainly found that to be the case. The nail polish is full of tiny red pieces of glitter with some larger silver pieces as well. The small red pieces coat the nail really well and I managed to get a great coverage with just two coats but I went for one more so the photo shows three coats. The nail polish dries pretty quickly between coats so there's no waiting round for ages with this one either. 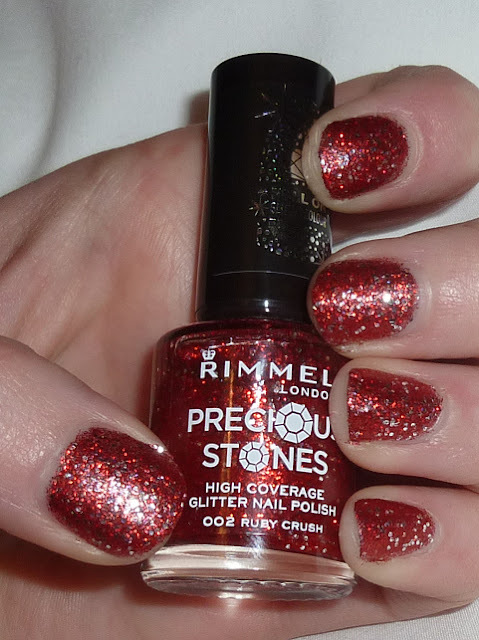 I absolutely love the colour and finish of this polish and I can't wait to wear it for my Christmas nights out. It actually looks like I've used a red glitter base polish and added a silver glitter top coat when I really haven't had to go to all that effort! 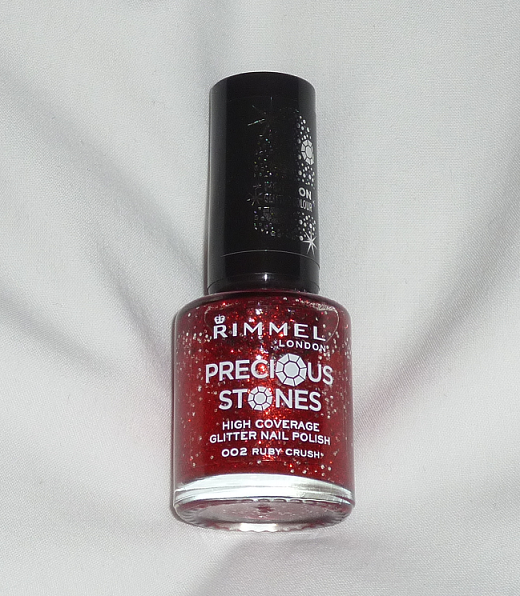 It's one of the best glitter polishes I've tried and I'm tempted to see what other Precious Stones shades Rimmel have to offer. Have you tried any of these polishes? Will you be picking one of these up for Christmas?